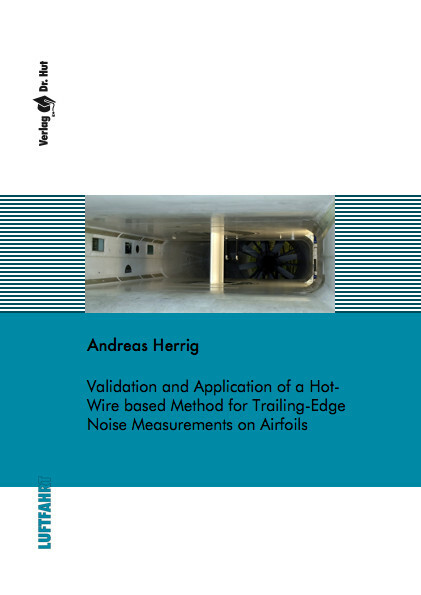 This thesis describes a hot-wire based method for two-dimensional trailing-edge (TE) noise measurements, mainly for use in wind tunnels with high background noise levels. The method is based on the cross-correlation of two hot-wire signals, allowing to measure the Coherent Particle Velocity (CPV) of the emitted sound waves. The directional sensitivity of the hot-wires leads to a suppression of parasitic noise, which significantly improves the signal-to-noise ratio. Evaluation of the cross-spectral phase allows isolation of the frequency ranges, where the TE noise emerges sufficiently from the wind tunnel background spectrum. To obtain absolute sound pressure levels, the velocity fluctuations are converted via a simulation of the hot-wire response to the line source. For validation of the CPV-method, five NACA 0012 airfoils of chord lengths of 0.2, 0.4 and 0.6 m were investigated in the Laminar Wind Tunnel (LWT) Stuttgart at different velocities and angles-of-attack. Results agree very well with known scaling laws, empirical and semi-empirical TE noise prediction models and data from acoustic wind tunnels. As an extension, to further increase the measurement range at low frequencies, applicability of scattered sound prediction from measured surface pressure fluctuations was studied and revealed very promising results. Also, valueable insights into global flow instabilities in laminar separation bubbles at the trailing-edge causing multi-frequent whistling tones could be gained.